A Shade Better features thousands of lampshades from which to choose. Whether your style is traditional, modern, or somewhere in between, we have the right shade (at the right price) to help you light your home more beautifully. See our gallery below to see just a few of the styles we carry in our store. Want to see even more lamp and lampshade styles? Visit our lamp gallery. When visiting A Shade Better in search of the perfect lampshade, be sure to bring your lamp with you. There is no better way to ensure a perfect selection for your lamp than seeing multiple options on the lamp itself. Our helpful staff would love to assist you in considering the best options so you can make the best choice for your home. In the meantime, gaining a better understanding of how to measure your current lampshade can help you know how to start searching for its replacement. 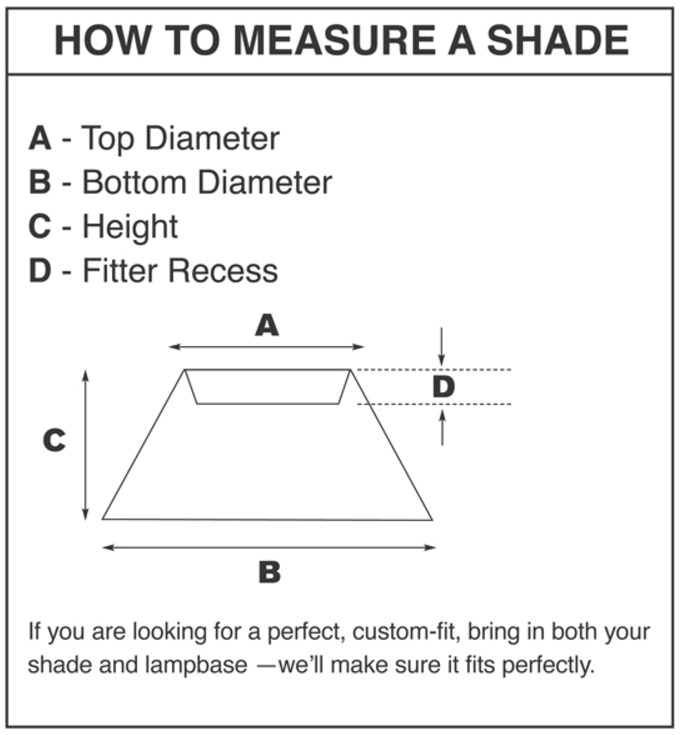 To measure your lampshade, simply follow the instructions below. You will want to be sure to measure the top diameter, bottom diameter, height, and fitter recess.